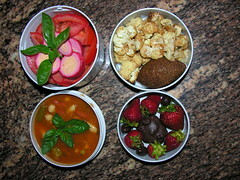 Here's the lunch I'm taking to work on June 1, 2007, in my Mr. Bento. The fried cauliflower and kibbeh are from a nearby Lebanese deli. The strawberries, tomato, and pickled egg are from a Maryland farmstand. The basil's from our deck herb garden. The soup's from Progresso. 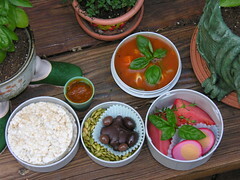 Here's an outdoor shot of the lunch (and breakfast) I plan to take to work in Mr. Bento on May 31, 2007. It's surrounded by our deck herb garden -- basil and thyme. The owl seems a little too interested in my lunch. 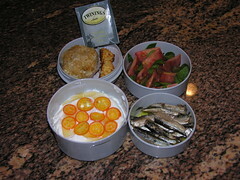 Here's the lunch I plan to take to work in Mr. Bento on May 31, 2007. We went to Ocean City, MD, over Memorial Day weekend and made a stop at a famrstand on the way home. Too early for Maryland produce, except strawberries, so the tomato is from the Carolinas somewhere. The beet pickle egg is Pennsylvaia Amish. The chocolate turtle and its raisin and almond eggs are sugar-free. 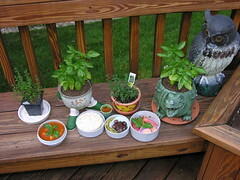 The minestrone is Progresso, but the basil and thyme are from our deck herb garden. The rickecakes (Quaker) and pumpkin butter (Carolinas) are really from breakfast. 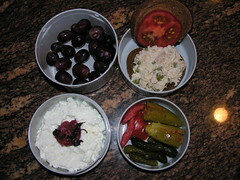 Here's the breakfast and lunch I've packed for Thurs., May 24, 2007. Except for the tea and the brown bread with pumpkin butter, they're leftovers. The rotisserie roast chicken is from Giant Food. 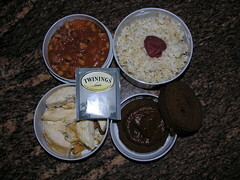 The smokey vegetarian blackeyed peas and stewed tomatoes were a drained can of Bush's blackeyed peas with a can of Contadina stewed tomatoes. In a saucepan, I sauteed until opaque a half-cup of diced onion in three tablespoons of olive oil. I added the drained bean and the stewed tomatoes, and mixd them up with a half-teaspoon of liquid smoke. Stirred it up and warmed it half-covered over low-medium heat for 40 minutes to thicken the sauce -- it still stayed preety liquid. I served it over a half and half mixture of brown basmati rice and white jasmine rice I cooked in the rice cooker. For breakfast, the brown bread is good old B+M canned; the pumpkin butter is from a farmstand in the Carolinas. How's this for a fusion lunch? 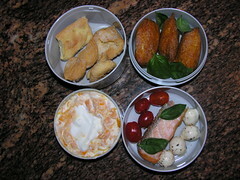 Kippered salmon accented with basil from our deck garden, with mozzarella balls and cherry tomatoes. Greek-style yogurt with diced mango. Inarizushi stuffed with genmai (Japanese brown rice). For dessert -- kichels my mother-in-law brought us from Florida. 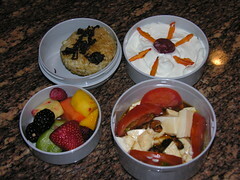 I'm taking this to work for lunch on Weds., May 9, 2007. The oolong tea is really for breakfast, though; probably with some pumperkickel toast. This got somewhat colorful, eh? The onigiri is made with brown japonica rice, and toasted in a lightly oiled frypan with temari soysauce and sesame oil. I keep a half-dozen in the freezer. The basil I grew out on the deck. The canned sardines are in olive oil, to keep the fats good. The greek-style yogurt I got at TJ's. I topped it with orange blossom honey from a fruit stand in Florida and sliced Whole Foods kumquats. This is a delicious lunch, too. 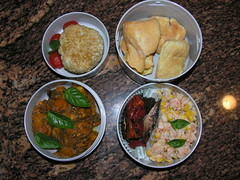 More Mr. Bento. 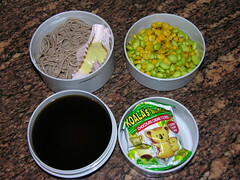 Here's the lunch I took to work on Monday, May 7, 2007 I boiled up some soba (Japanese buckwheat noodles). In the cupcake paper is some pwdered wasabi mixed into a paste with a little water. The veggies are a mix of Trader Joe's frozen roasted corn and TJ's frozen edaname (soybeans), in a lemon-mustard vinaigarette. The dressing is prepared mustard, lemon juice, olive oil, salt + pepper, and dried mixed Italian herbs. The dipping sauce for the soba is dashi broth, temari soy sauce, and mirin. The cookies made by Lotte are from the Asian market. What do you know? CNN Headline News is as fascinating as C-Span! I was out midday on my way home from a doctor's apppintment. So, I hit Whole Foods for eats. The fruit salad is great, The homemade tofu salad I need to work on. The recipe said to use silken tofu, but I think I prefer something with a little more bite to it. The rice ball is a yaki onigiri (toasted onigiri), made of brown rice (genmai). I made a half-dozen couple of weeks ago and froze them. I have a 5-lb. bag of Japanese brown rice -- 53 servings. Only about 45 to go.